Oron Catts is the Director of SymbioticA- The Centre of Excellence in Biological Arts, School of Anatomy and Human Biology, The University of Western Australia. Under Oron’s leadership, SymbioticA has gone on to win the Prix Ars Electronica Golden Nica in Hybrid Art (2007) and became a Centre for Excellence in 2008. Catts is an artist, researcher and curator whose work with the Tissue Culture and Art Project (which he founded in 1996 with Ionat Zurr) has exhibited and presented internationally. The latest show he curated was Visceral – the Living Art Experiment at the Science Gallery, Dublin, 2011. The Autotroph is a solar powered kinetic sculpture and fountain. It ironically explores the problems and possibilities of technological solutions to human induced climate change. The Autotroph is an overly technological and playful exploration of the immense complexity of dealing with ecological issues. Any action postulated raises possibilities of good and harm to different aspects of the ecology, and this is without even considering the unknown unknowns (to quote Rumsfeld). The challenge of this project is to tell the stories of these complexities, but not to solve them. 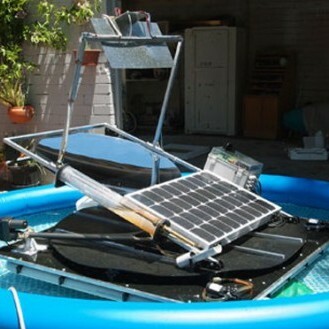 The Autotroph consists of a floating solar still; in this exhibition the Autotroph floats in an artificial body of water, using the rays of real and artificial suns. The still deploys a computer controlled focussing mirror to achieve sufficient heat to evaporate water. The steam generated is condensed and flows to a Japanese style water feature back into the body of water. The work is inspired by Lake Clifton, south of Perth, Western Australia. The lake and its inhabitants, including the Thrombolites, are under threat due to salinity, urban development pressures, global warming and land misuse.